Last chance to enter the giveaway for a $10 credit at The Zipper Store! Winner will be drawn tomorrow. Go to the original post to enter. Yesterday I finished this clutch. It is the same body style as the aqua one from Sunday. The flap fabric is a Kokka cotton/linen mix I've had for a few years now. The body is a linen/rayon upholstery fabric. I'm considering offering just the pattern pieces for this and some very basic instructions. A lot of people don't need the really detailed instructions, and right now I have a few admin projects taking up my sitting and writing time, and I can't squeeze in a step-by-step pattern. There is only so much computer time I can handle and remain a well-adjusted, reasonably sane person. Would you be interested in having just the pattern pieces and simple instructions for this clutch? This is something I would offer here on my blog for just a few dollars. Oh my...look at how lovely this clutch turned out in this beautiful blue fabric! I've had this upholstery fabric remnant for a long time, and yesterday I was in the mood to sew a bag with a curved top like the Curvy Clutch. It has been a long time since I've sewn one of those. This fabric is fairly thick, but on the medium range of upholstery fabrics. I used the same trimming techniques used in the Strap Clutch pattern. They helped a lot. Besides the upholstery exterior, the interior of the clutch is quilted with cotton batting. My machine probably wouldn't deal well with all these layers of fabric without the extra trimming. For the lining, I used a print called Petalicious from Marcus Brothers. Let's Make Dumplings! Zip Pouch Tutorial. Ok, are you ready to make dumplings??? These cute little pouches don't take long to make, and the construction is pretty basic. But keep in mind the zipper is attached to a steep curve, so these are a sewing project for those with intermediate sewing skills and confidence with zippers. 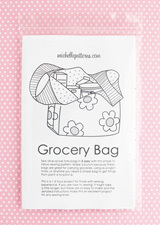 This free tutorial assumes you know how to sew zippers, attach binding, etc. You might want to try "The Easier One" first. This one measures 5.25" x 2" at the base, and about 3.5" high (13 x 5 x 9cm). The one labeled "The Harder One" is even smaller and cuter, and a challenge to sew. Just pay extra attention to getting the zipper lined up neatly before sewing the final steps. This one can be made with a 12" zip, but then it is even harder! The Harder One measures 4" x 2.5" at the base, and about 3" high (10 x 6 x 8cm). 1. Cut and interface pieces. 2. Mark zipper & clip. On one end of the zipper tape, draw a guide line across the bottom of the zipper at 2" (5cm) for "The Easier One", or 2.5" (7cm) for "The Harder One". Clip the zipper tape on both sides. Clip about 0.25" (7mm) in from the edge, with about 0.75" - 1" (2 - 2.5cm) between clips. 3. Unzip zipper and then hand baste it to exterior fabric. 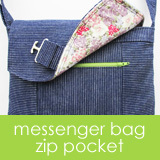 Zipper and exterior fabric piece are RIGHT sides together. Match the guide line to the fabric edges. 4. Hand Baste lining in place on top of exterior fabric piece with attached zipper. 5. Machine sew pieces together (use a 1/4" allowance) & then notch curves. 6. Turn right side out, and finger press seams around zipper. Topstitch around edges of zipper. 7. Sew both ends & trim zipper. Zip dumpling up so the lining side is facing out. If the fabric has shifted during sewing, the ends might be uneven. Use a straight edge and pen to draw a straight line across the end as a sewing guide. Make sure the zipper teeth are lined up evenly on each side before sewing the ends in place. At the top end of the zipper (where pull rests when zipper is closed) you might find it beneficial to hand baste the two sides of the zipper together to keep them even. Open and close the zipper as necessary when sewing. Make sure zip is open somewhat before sewing the end with the top of the zipper (i.e. pull needs to be somewhere along the dumpling curve before sewing the end). 8. Cover the raw edges of both ends with binding. P.S. Yes, you can sell your dumplings. Please offer me credit by linking to the tutorial or my pattern shop. 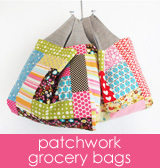 If you've enjoyed making these sweet pouches, please remember me for your next sewing project.